In a newly translated interview, Hamas spokesperson Husam Badran declared that his terror organization is holding truce talks in Cairo with Israel being held "at gunpoint" to accept the group's demands. Middle East Media Research Institute (MEMRI) translated the interview from Al Jazeera, which is sponsored by Qatar, a key provider of Hamas funds. In it, Badran relates being asked in jail in 2002 by then-deputy head of the Shin Bet (Israel Security Service) whether Hamas will ever negotiate with Israel. "I said to him outright: If we ever negotiate with you, whether directly or indirectly, we will do so with our weapons in our hands. If we get what we want, so be it. If not, we will shoot you in the chest. What I said back then is how Hamas negotiates now," stated Badran. Hamas's lavish demands in the talks include serious threats on Israel's security, such as the release of terrorists, the opening of borders, as well as the establishment of a sea port and airport in Gaza. The Hamas spokesperson also clarified that his organization "began preparing for this confrontation the day the 2012 war ended," a reference to the last counter-terror operation in Gaza, Operation Pillar of Defense. 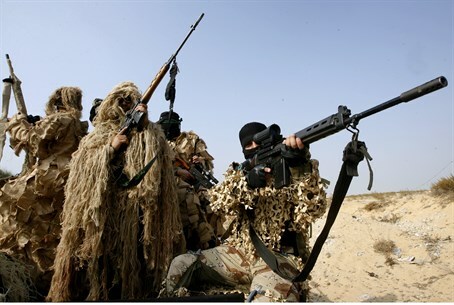 The statement comes as Hamas announced its position on the ongoing Cairo truce talks Tuesday, saying "the warriors in Gaza are waiting with Allah's help to renew the fighting, or to return to planning the next campaign. There's no escape. Either jihad or planning (for the next jihad)." Together, the statements leave no doubts that Hamas intends to begin preparing for the next confrontation immediately after the current operation. Badran revealed that during the time since Pillar of Defense, "hundreds of our men were martyred digging the tunnels during the previous lull period. ...The mujahideen of the Al-Qassam Brigades were getting ready in the tunnels." Those who survived digging the terror tunnels did not meet a better end than their compatriots; in recent weeks Hamas has executed dozens of the diggers to make sure they would not reveal information about the locations they were digging in. The Hamas spokesperson also bragged of how Al-Qassam Brigades engineered domestic missiles and "drones that many countries in the region lack." In several cases the IDF shot down drones launched by Hamas during the operation. Recovered remains of the drones revealed they were armed to conduct attacks on Israeli civilian population centers.